Winners will be announced Wednesday, March 28 and contacted by email. Winning drawings will be posted this week. Congrats to all who entered! Announcing: The Case of the Perfect Dog Contest! 1st Place Prize: 1 Personalized, autographed copy of Hank 59, 1 pack of Hank the Cowdog playing cards. 2nd and 3rd Place Prizes: 1 Personalized, autographed copy of Hank 59. To Qualify: Just submit your best drawing of a Yellow Labrador to hank@han....dog.com (a photo of your drawing, scan of it, etc.) along with your name and age. 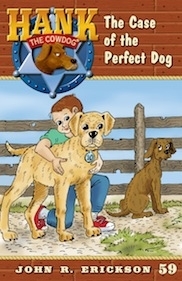 Or, if sent by mail, please address to: Maverick Books, Inc., The Perfect Dog Contest, PO Box 549, Perryton, TX 79070 (also include your name and age). We're sorry, original artwork can't be returned, so please send us a copy of your drawing. And, don't worry, it doesn't need to look like Happy (Book 59), just do your best drawing of your favorite lab! Details: After March 23rd, we'll post up the winners on the website! So, even if you don't enter, be sure to check back and see the winning drawings! Please ask any questions in the comments section below.